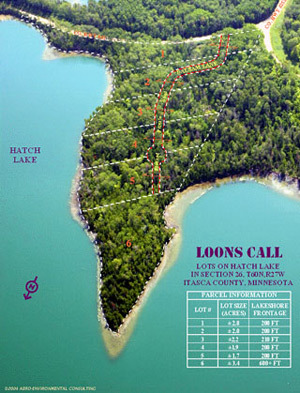 Marketing of lakeshore, rural acreage or business property can be difficult. What can an owner, real estate agent or developer do to present the most dramatic views of property to prospective buyers? How do you show that the property is great for hunting, fishing, recreational uses and/or the perfect business location? 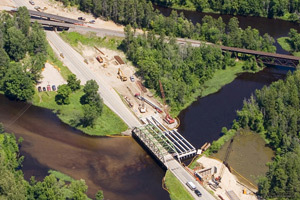 What can you do to show a prospective buyer unfamiliar with the area that the property is located in an area surrounded by public land, lakes and recreational trails or that the business location has the appropriate transportation and/or infrastructure available to assure economic success? Aero-Environmental Consulting believes that aerial photography provides an economical solution for real estate and/or business marketing problems. Aero-Environmental Consulting provides both aerial and ground based high resolution digital photography for real estate marketing, land development and/or business advertising. 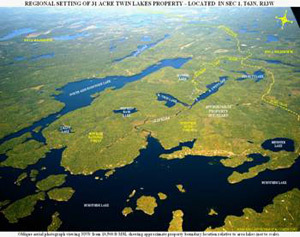 A standard marketing package provides several views of the subject property including its regional setting using annotated topographical maps and aerial photographs shot from high altitude with the resulting digital images annotated to show overlaid property boundaries, surrounding highways and access roads, recreational trails, public land, lakes, rivers, etc. The regional views are followed with images showing more site specific annotations like platted lot layouts, parcel designations, access road detail and structures. Scalable vertical images are also available. Close-up images are also provided to show property highlights and/or to showcase the scenic building locations and/or business location potential of the property. Please read on for additional information and examples of how Aero-Environmental Consulting can help market your property or promote your business using high resolution digital aerial photography. Aero-Environmental Consulting provides high and medium altitude oblique aerial photos with annotations identifying regional and local points of interest. The annotated oblique aerial photographs provide a more intuitive view of the subject property's location than the pure map view. We like to call it the "Big Ladder View". 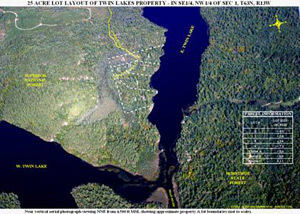 The annotated aerial images are formatted and saved as *.JPG image files for posting on client websites. After conducting the high altitude photography of the regional setting the aircraft descends to lower, but safe, altitude to take close-up shots of the property. Zoom lenses allow framing images of the subject to show many levels of detail from the same safe altitude. If requested, Aero-Environmental Consulting can include annotated USGS topographic maps to show the regional and detailed location of subject properties to marketing packages. This allows for highlighting of nearby access roads, recreational trails and/or major highways, towns, parks, lakes, rivers and streams in a recognizable map format. Close-up views of a property can be annotated with text and graphics to show the platted lot design. A legend to show both lot size and asking price and/or other information can be included right on the photo so prospective buyers can easily view the image and evaluate lot of their choice. The lots annotated in the images are created as polygons in a graphics program. When a lot sells the client's marketing package can easily remain current by hatching and/or marking it sold with text on the image. This updating service is provided for web images via e-mail at no extra charge to real estate/developer clients. Vertical image of the same property shown in the previous section showing platted lots with a property information legend. Scalable custom survey coordinate georeferenced images for site specific GIS now available! Aero-Environmental Consulting has expanded its graphics capabilities to allow for survey coordinate georeferencing of vertical images using ArcGIS software. We can also provide full ortho-rectified (3D) data and imagery at sub-1'/pixel resolution (X,Y,X). We have provided Ortho-Imagery, Digital Elevation Models (DEM), and Point Cloud data sets to mining companies. This makes it possible to assist developers and their surveyors by producing scaleable images for supporting wetland delineations, as well as conceptual and preliminary plat design. Technical users will be able to order custom survey coordinate georeferenced images for site specific GIS projects (land use, inventory and/or development). These images should prove cost effective for sites where detailed vertical images are needed and additional oblique images are important for report figures especially when publicly available images are outdated, at the wrong scale or lower resolution than the job scope requires.